Important information for all CrossFit athletes that will scale 19.3. The vast majority of Crossfitters will be scaling Open Workout 19.3 this weekend. As the workout involves harder movements such as strict handstand push ups and handstand walk. You can find all the full details below but generally the handstand walk will be replaced with a bear crawl. The handstand push ups have an elevation and the dumbbell will be done in the front rack position rather than overhead. Prior to starting this workout, the athlete will need to mark a starting point on the floor, then measure out no more than 25 feet and make another mark on the floor at the finishing point. Additionally, marks must be made every 5 feet to create sections, each of which represents 1 rep of the lunge and handstand walk. A box measuring 36 inches wide and 24 inches deep also must be marked on the floor in front of the wall where strict handstand push-ups will be performed. This workout begins with the dumbbell on the floor and the athlete standing tall. After the call of “3, 2, 1 … go,” the athlete will pick up a single dumbbell and lunge with it overhead for 200 feet. The athlete then will perform 50 dumbbell box step-ups with one dumbbell. After completion of the dumbbell box step-ups, the athlete will perform strict handstand push-ups. Once 50 strict handstand push-ups are completed, the athlete will handstand walk for 200 feet. The athlete’s score will be the time it takes to complete the workout or the total number of repetitions completed before the 10-minute time cap. 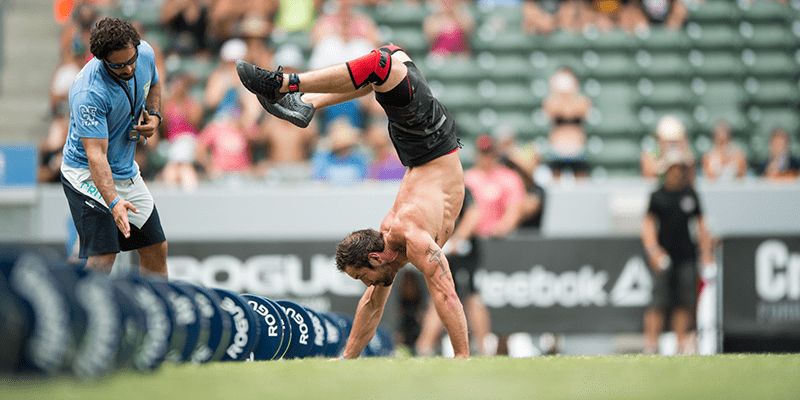 To see CrossFit Games Head Judge Adrian Bozman’s three critical tips for judging strict handstand push-ups in Workout 19.3, click here. New for 2019, the CrossFit Games Open will be the single largest qualifier of athletes to the 2019 Reebok CrossFit Games. The top 20 men, 20 women and the fittest male and female in each country will receive an invite to the Games in Madison. This handy link below provides you with a quick resource to identify and include many different types of protein in your diet to ensure you can recover well, build muscle and perform well throughout the entire competition and beyond. Recovery is absolutely vital during The CrossFit Open so that you can consistently perform throughout the whole 5 weeks of fun.